Extreme sports present us with news ways to get our adrenaline pumping every day but as we run out of ways to get new thrills some truly strange and yet fresh ideas start coming out of the woodworks for new kicks. Some are variations of existing sports, while others are an entirely new and dangerous way of seeking out adventure. While some may seem silly at first, my travels have shown me that more and more of these arbitrary extreme sports are becoming huge on the scene and taken up by young and old alike. Here I plan to tell you about some of the biggest in the last few years. 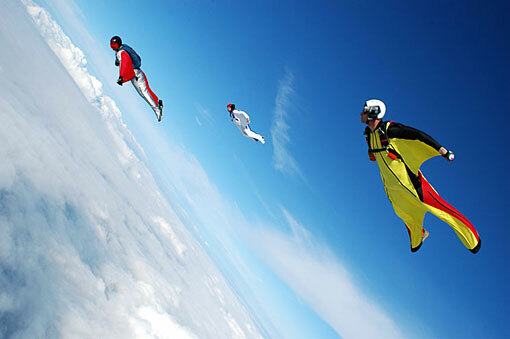 Novices aren’t allowed to even give this a try and only qualify for the sport after 500 sky dives. Of course what advanced diver could resist the temptation? This sport entails donning a bird man suit, which is essentially a webbed outfit that allows you to ‘fly’ sometimes even above the plane line. Divers do in fact, look like birds and are suspended for a second or two as the air catches somewhat and allows them to glide. Unfortunately, fresh water waves aren’t available to everyone and for surfing enthusiasts who are stuck too far from the waves, there’s little that can give them the same feeling. 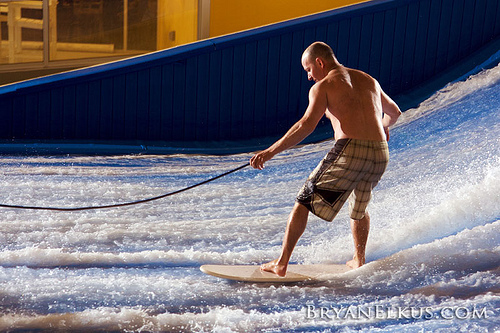 This is probably where the concept of motorized surfing came from. The idea is that you are on a surfboard that can fly, significantly faster, over any watery surface with at least 10cm depth. This fast paced sport does, however, require some balance and the ability to fall, over and over again. 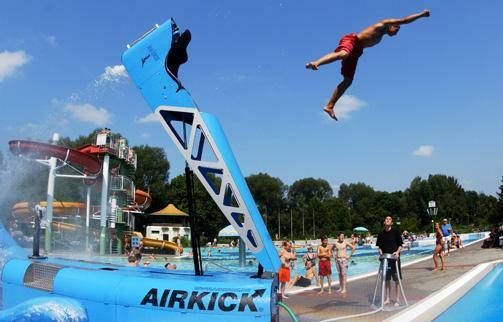 A favorite at camps and outdoor events, airkicking involves being propelled in the air by what is essentially a human catapult and landing in some body of water or on a foam bed. It got its name as its victims are usually kicking away while they fly as far as 8 meters before hitting whatever soft surface they’re about to land on. This sport seems to be particularly big in the States, where local celebrities also get involved. In the last three years, however, it’s blown up in most western countries. It involves free running and basically jumping from wall to wall, hanging from anything you come across, backflips and elements of gymnastics as well. There are a number of show reels on the net that can give you an idea of just how incredible this sport has become and how these ‘tricks’ have evolved. Many people confuse slacklining with tightrope walking but in fact, it’s much more difficult and nerve-wrecking for spectators. It entails setting up a nylon ‘tightrope’ without pulling it too tightly, allowing the slackliner to bounce on it, move back and forth etc. 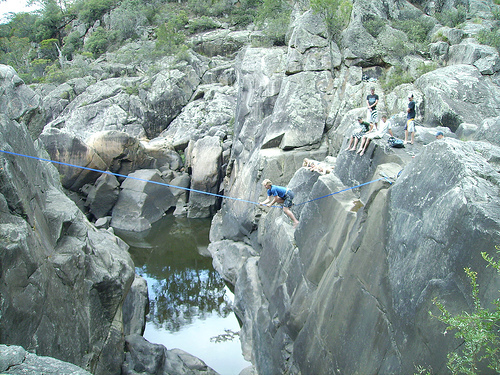 The highest recorded slackline experience was at approximately 1000 meters in the air. It’s safe to say that as a species, we’re never going to run out of ways to entertain ourselves and appease the thrill seekers. If you’re an avid adrenaline junkie, why not try some of these exciting sports that have blown up over the last few years? 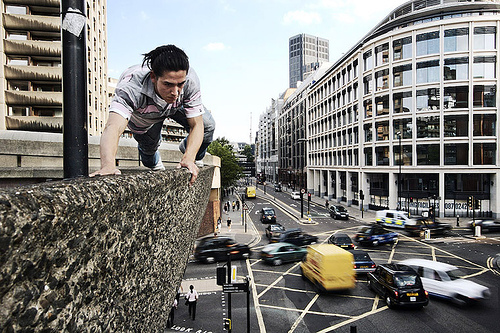 This entry was posted in Air Sports, Bizarre, Land Sports, Parkour, Sky Diving, Surfing, Tightrope Walking, Water Sports and tagged Airkicking, Bird Man Suit Sky Diving, Motorized Surfing, Parkour, Slacklining. Bookmark the permalink.